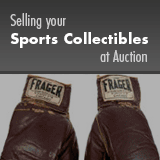 What's My Sports Memorabilia Worth? Should you consign to a Heritage Auction? How much are my Collectibles worth? What Do I Have and What is it Worth?